Finally in First: I Have NEWS! I have a new blog design! What do you think? Why did I decide to design my own? 1. I didn't LOVE the free template I had and for the amount of time I spend on here I should! 2. I started seeing my same header on other blogs and I wanted my blog to have an original look. 3. I wanted my blog to reflect me...Can you tell I love polka dots and have a thing for owls? Here is the super cool part~ if you already have my button, it is magically now in the new design! My husband and and I are taking the plunge and starting to offer blog design services! Bill is a computer genius and I love digital designing so it makes for a perfect partnership. I will be adding a page about our blog design services soon but I was too excited not to share now with my blog buddies! Since I am in such a good mood, let's play a little game. Who can answer these questions about the above picture? 2. What was his tag line? Ok, first your new design is ADORABLE! You are very talented. 2. 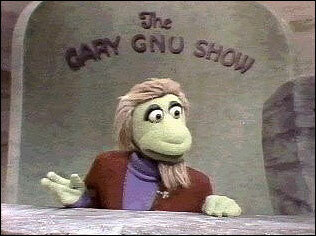 "And Here's Gary Gnu, with The Book Of The Week In Review"
Your blog still looks amazing!! No Gnu's is good gnus! Love your new look! It is super cute! This is Gary Gnu with the no gnus is good gnus show. Love it! I love the look! Good luck on your new business venture. No Gnews is Good News! Well done! Thank you for being my very first follower! It is fitting since your blog was the very first that I began to follow. You actually, without knowing it, were the person who introduced me to the amazing world of blogging!! Thank you!!! I love it! "No gnews is good gnews." I love the polka dots! I have been struggling with my blog design lately and would love to be one of your first customers! I hope to see your ordering information soon! Thanks for the compliments! The Great Space Coaster was the show and he always said, "No gnus is good gnus." Not sure of the spelling since it is made up? tmarie-I'd LOVE it if you were our 1st customer! I will email you. Oh my gosh!! Its adoroable!!! I can't answer either question but I am in LOVE with your new blog design!!! My first design was a free template with polka dots and owls. Now I've just embraced the polka dots...love em'! You're so creative and such an inspiration! I'm LOVING the polka dots! I love ALL things polka-dotted! Loving the polka dots and the owl! Very cute! I love the new design. I have that same feeling of trying to be unique in blogland. Sometimes it's hard to do. I LOVE your new design!!! I really LOVE it!! I can't wait to see what else you have in store! I will of course put you on my blog design Sqworl page!! I'm going to have to be one of the first in line for my own look!! Thanks for being my 2nd follower on my blog! I'm so excited! Sweet Jenn...your new design is adorable!! Just wanted to pop in and wish you the best of luck with your new business venture!! So excited for you :) Love it!!! I tried to post leaving my blog link code that you gave earlier...I must have done something wrong..I got an error saying I can't use http:// when leaving a post..but that was part of the code...not sure...anyway come check out my latest blog. 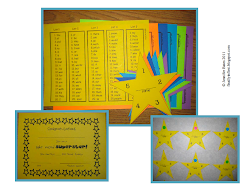 I had tons of fun joining the Blog Hop linky party of favorite books at Runde's Room. 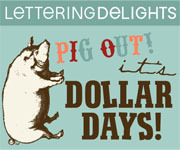 Come check it out at my blog and you can even see all of the entries direct from my blog since it is a Blog Hop!! Fun Fun!! Oh love love the new design by the way...can tell we have something in common!!! WOW, thank you for all the nice compliments!! 1) I love your new blog design. How much will you be charging for services? I need a new blog design, as well as some tips on how to upload my freebies. I love your new design. It is beautiful. I am wishing you and your husband the best of luck in your new venture!